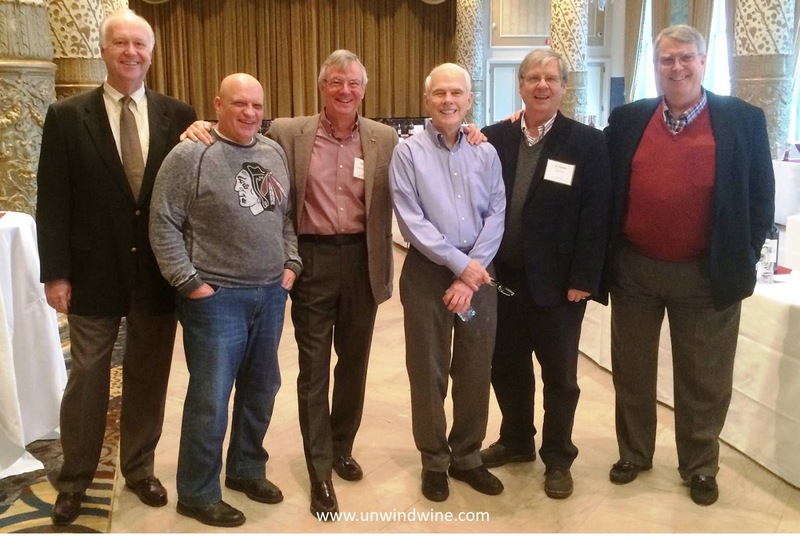 The UGC Bordeaux' (Union des Grands Crus de Bordeaux (UGCB)) producers' annual North American tour descended on Chicago this week to showcase their 2013 vintage release. The UGC is an association of 133 grands crus producers from heralded Gironde estates. 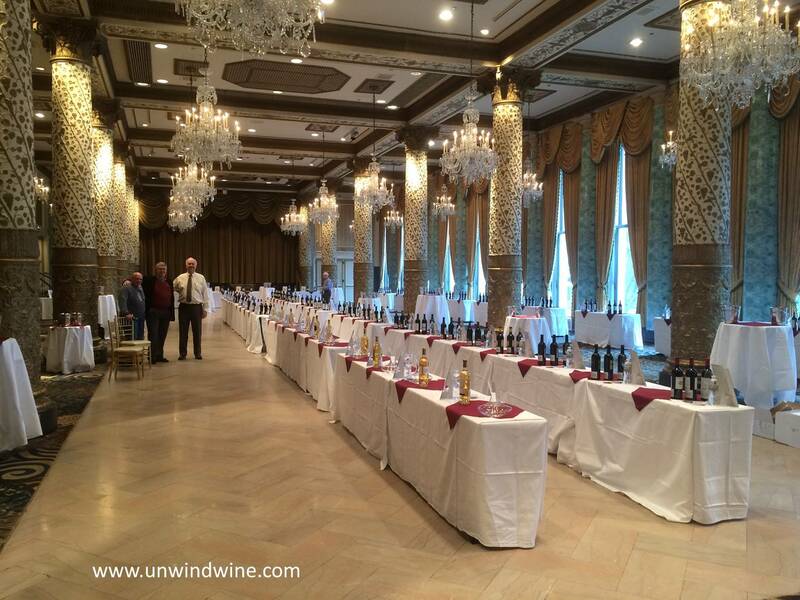 My blogpost from last year's tour event talked in more detail about the UGC and the Bordeaux classification. Once again, the event is organized by Napa based Balzac Communications, under the direction of Founder Paul Walker and CEO/Principle Mike Wangbickler. About 450 members of the trade and media were treated to taste the latest vintage release from eighty-two producers that were scheduled to attend. 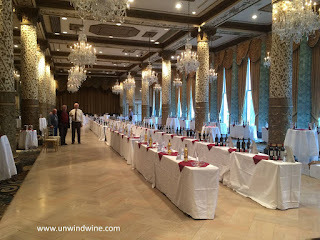 Then, about 250 attendees attended the evening session that is open to the general public, hosted and orchestrated by Doug Jeffirs and the wine team from Binny's Beverage Depot, the Chicagoland superstore. As in recent years, the event is held in the magnificent ballroom (left) of the Drake Hotel on Chicago's North Michigan Avenue Magnificent Mile, overlooking the famous Lake Shore Drive curve and Oak Street Beach. Its a wonderful event and we're grateful to the producers who participate in this ambitious and rigorous trip across North America. 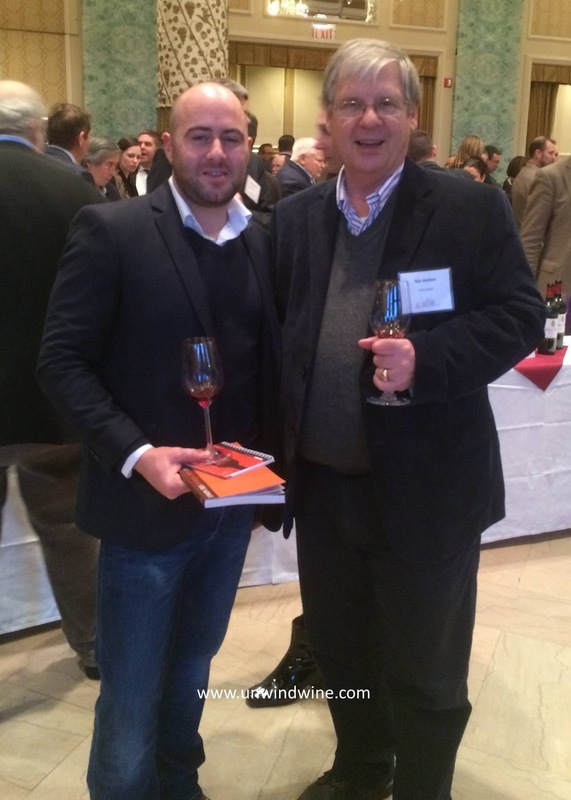 This year the itinerary has been expanded to eight cities as new stops have been added for public events in collaboration with select merchants in Florida and Canada, such as the Binny's event here in Chicago. 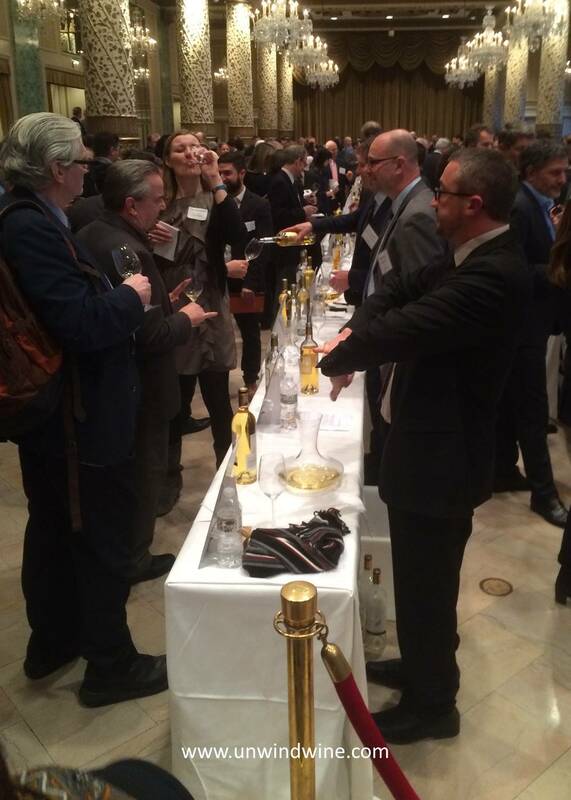 Its a pleasure to meet the Chateau owners, winemakers, commercial and marketing representatives who attend from the Chateaus. I recognize and appreciate the huge investment and commitment of their time and effort to participate. This year the weather in Chicago was unusually mild and warm, more than offset by the blizzard that hit the Northeast dumping two feet of snow on New York. Lucky for the tour the storm hit over the weekend reducing disruption, unlike the last two years when several producers faced flight delays and some cancellations. Once again, the Pour Boys wine team participated to assist the attending Paul and Michael of the Balzac Communications Group team who manage the event - setting up, registering participants, and standing in for producers pouring their wines, hence the name Pour Boys, obtained in recent years when many of the producers were no-shows or late arrivals due to winter storms. 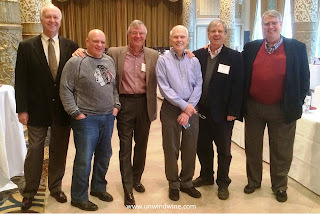 The Pour Boys are avid wine collectors, our wine dinner group that meet regularly for wine centered tastings and social events - shown left, Ernie, Dr Dan, with Paul W, Lyle, me and Bill, as the core group. Such an event is great fun, an escape and vast departure from our normal daily duties tending to corporate litigation, dentistry, high tech, and retirement, when not working these events. Members of the trade may also recall us from last fall's Grands Crus Classes of St Emilion 2015 Chicago tasting. Son Ryan and I both attended with special interest this year since 2013 was the birth year of his son Richard Reid, as well as my other grandson John Richard (Richie). So, we're looking to invest in a horizontal collection of 2013 wines to commemorate their birth year as is our practice. Indeed, my collection of my kids' birth year wines was the basis for my cellar being featured in the Collector section of Wine Spectator Magazine back in June of 2001. The next generation represented by Jared Gelband (shown with me, left), Sommellier at the Wine Bar in the Intercontinental Hotel Chicago, special friend of son-in-law Johnnie and daughter Erin. The 2013 Bordeaux vintage presented some challenges for the winemakers, starting off as one of the coldest and wet starts to a growing season in more than 40 years and a later than expected harvest. One silver lining to the intense cold faced early was that it may have helped hinder potential diseases in the vines. An impact of the difficult year were lower crop yields, which when managed properly can still result in some fine wines from Producers with terroir, care and attention to detail, and a bit of luck. Watch for lower volumes in the premium labels with more volume attributed to the lesser labels. A benefit for consumers may be a moderation in prices if they properly reflect the challenging 'lesser' vintage. Looking back on some other similar years, perhaps 1991 and 1992 following the spectacular 1990, these releases provided some good values for more moderate priced drinking. Most likely, these wines will be ones to provide earlier drinking gratification rather than be properly structured for long term aging. This provides collectors a possible chance to enjoy these off year wines while the greater vintages continue to mature. Bordeaux along with the rest of France endured a cold February and March, and May was especially cold and wet. Things only got worse in June with an early storm as the cool wet weather continued. Finally warm days came in July with early heat spikes, but still excessive moisture persisted with another storm coming late in the month, perhaps the worst storm in a decade or more. Finally things improved with warmer days and sunshine arriving in August and continued into September, only to be faced with another storm late in the month. With the shorter season and less heat, along with lower yields, also look for lower and less developed tannins from the lesser ripe fruits, look for highlights of 2013 to be the white Bordeaux, especially the Sauternes and Barsac. This was evident in the tasting as the Sauternes and Barsac appellation seemed to be the highlight (left) with all labels showing well. I personally especially liked the Latour Blanche which stood out with its apricot punctuated forward fruits. 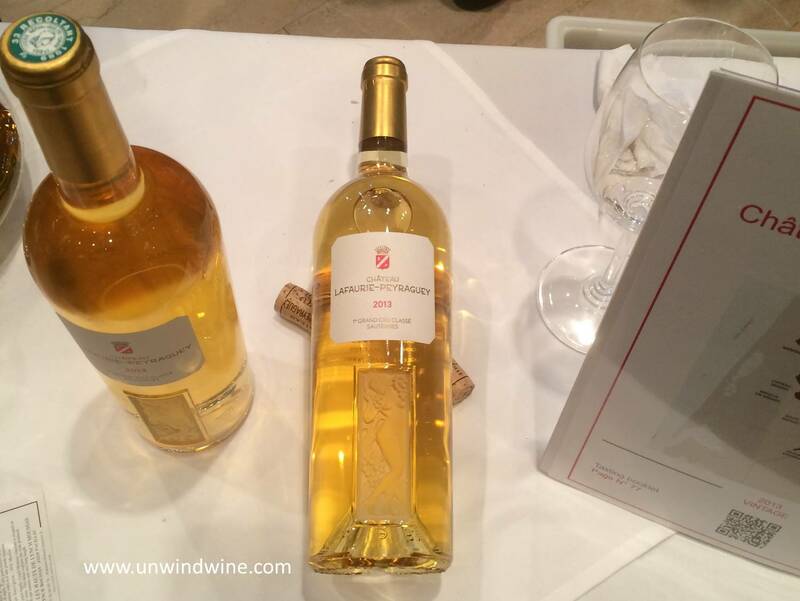 The St Julien appellation stood out with highlights being Chateaus Talbot and Beyechevelle. It was a surprise to see David Launay, former winemaker for Gruaud Larose attending again this year, but this time representing Chateau Grand-Puy-Ducasse (and Chateau Meyney, not presented). 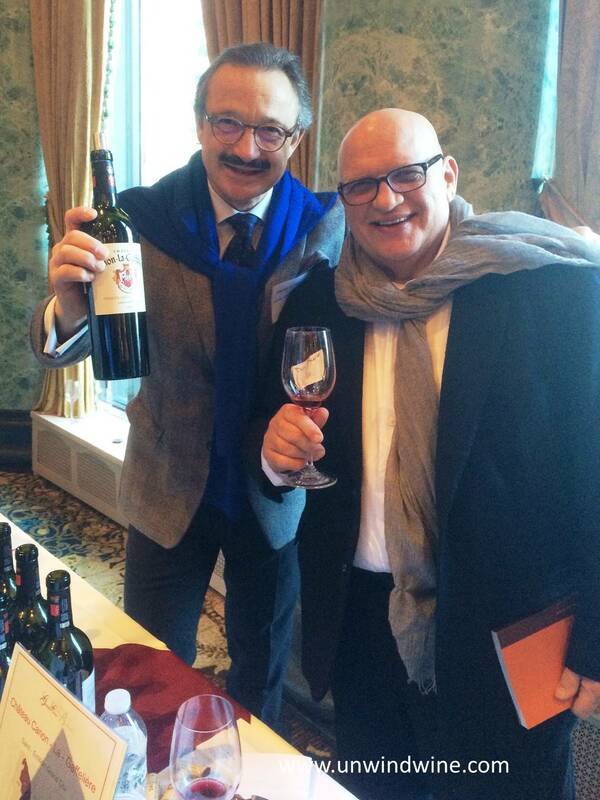 I thought the Pauillac standout was Pichon Baron. I sensed it would be when I opened the bottles earlier, in preparation for the opening of the event, when the room burst with aromatics of floral and berry fruits. 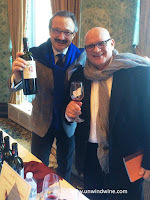 Chateau Clinet and Chateau Troplong Mondot were both notable from the right bank. Canon-le-Gaffeliere was remarkably light, almost delicate, with a layer of sweetness ... ready for early drinking gratification, but not built for long term aging. 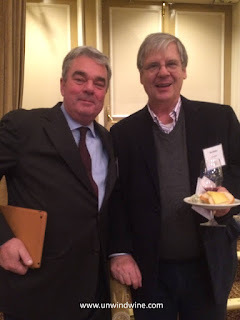 The always delightful, Bernard Olivier attended representing Pessac Leognan Domaine Chevallier, but the evangelism duties were attended to by son Hugo while Bernard tended to ambassadorial duties as presiding President of the UGC. I watch and enjoy observing this transition as I enjoy the experience with my own son Ryan in the progression of his wine appreciation and knowledge, as well as his own cellar collecting. The 2013 vintage should provide some lower priced wines that will provide earlier near term drinking. The Chateau represented on this year's tour.